In this project, we will build a simple NAND gate circuit using a 4011 quad NAND gate chip. This circuit is as basic as it gets for a NAND gate circuit and it demonstrates all the possible input values that a NAND gate chip can receive and output. We will use a 4011 chip as our NAND gate IC. The 4011 chip is a quad NAND gate IC. This means it is made up of 4 completely independent NAND gates, so we can use up to 4 NAND gates if we want. However, in this circuit, we will just use one NAND gate, to make the circuit as simple as possible. To the output of the NAND gate we use, we will connect a single LED, just so that we can see visually when the NAND gate turns an output on and off. For this circuit, we will connect pushbuttons to the 2 inputs of the NAND gate. This way, we can see what combinations of inputs will make the NAND gate be off and what inputs make it turn on. The pushbuttons, unpressed, will normally be held at a HIGH value of VCC, giving both inputs a HIGH logic level. When we press down on a pushbutton, it changes to a logic level of LOW. Thus, we can test out all logic levels. 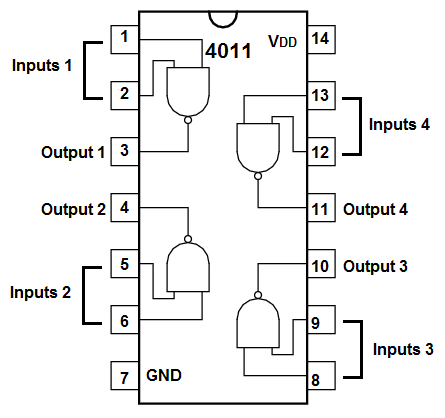 The schematic diagram of the NAND gate circuit using a 4011 is shown below. To each of the pushbuttons we connect a 10KÎ© resistor. These resistors function as pull-up resistors. They pull-up the pushbutton to VCC, a logic level of 1, so that the pushbuttons normally have a well-defined logic HIGH (or 1) status. The resistors also keep Vcc from directly shorting to ground when the pushbutton is pushed down. Thus, the pushbuttons, when left alone, unpressed, will normally have a logic value of 1. Thus, when both are unpressed, 2 logic HIGH (or 1) values are input into the NAND gate, which means the NAND will produce a LOW (or 0) output. Remember, that two logic HIGHs will produce an output of logic LOW for a NAND gate. Thus, the NAND gate will not power on the load, so the LED will be off when neither of the pushbuttons are pressed down. When a pushbutton is pressed down, the pushbutton now makes contact across to ground. The corresponding input pin will now be grounded and its logic level will change to a logic LOW (now that it makes contact down to ground). When either one or both of the pushbuttons are pressed, the NAND gate will output a logic HIGH (or 1), and the load connected to output will be powered on. So the LED will turn on in this case. And these situations comprise all the situations that can arise for a 2-input NAND gate.